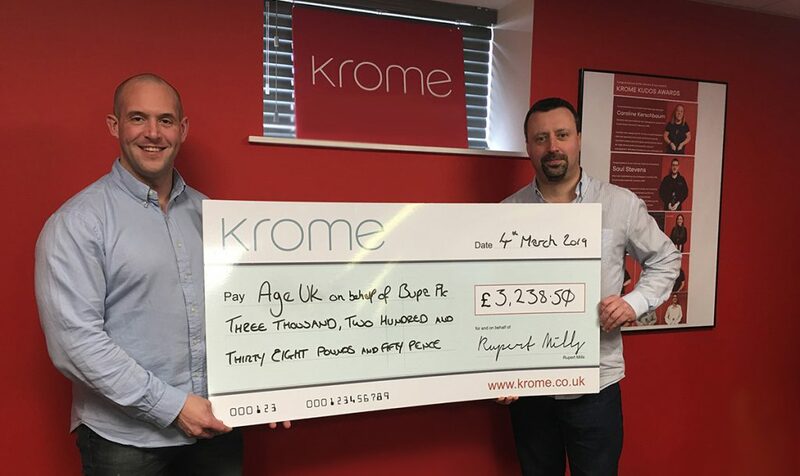 Krome Technologies and Bupa donate £3,238.50 to Age UK, the UK’s largest charity working with older people. Krome Technologies has been working with Bupa for a number of years, supplying and installing their desktop estate for their offices and care homes nationwide. Part of the service that Krome deliver Bupa is to remove their legacy hardware for disposal or where possible for re-sale. The amount donated to Age UK came from the recent proceeds made from the re-sale of equipment. Age UK’s mission is to be there for every older person when they need them the most, offering friendship, advice and practical help to older people in the UK. This donation, for example, could help them to answer nearly 500 calls to their advice line from lonely or vulnerable older people. If you have a technology refresh planned and would like to speak to a member of the team about our deployment services including equipment disposal and refurbishment please do not hesitate to get in touch.